On Saturday, Joe, Mom and I went to the local pool to get pumpkins in a weird way; we swam for them. It was really fun. 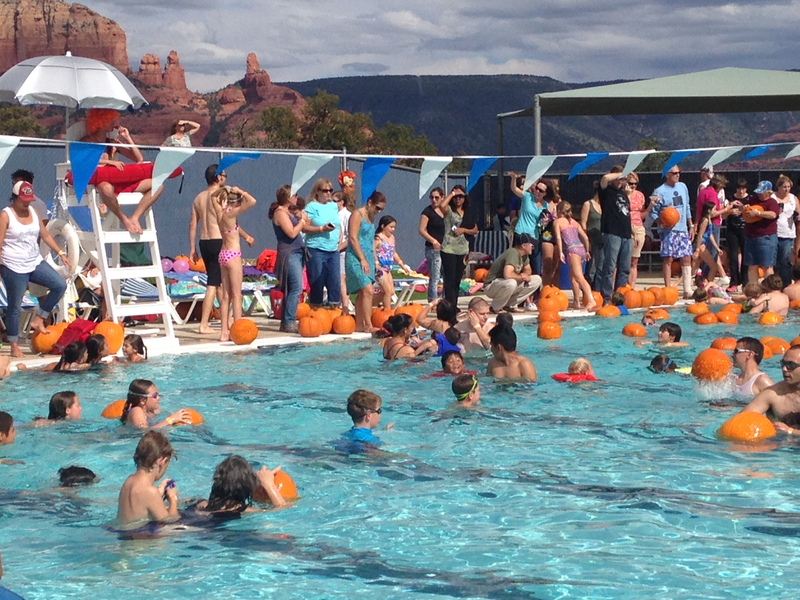 There were 300 pumpkins in the pool! We got candy apples (I am eating the leftovers as I write this). You have to take a swim test to go in the deep end (that’s where all the big pumpkins are). The first thing the life guard said to me is “nice stroke, you should join the swim team”. I felt pretty good about myself (I always do). Also, I am really good at bobbing for apples. They give you candy every time you get an apple so I decided to rip them off. It was really fun. I do not recommend coming here to Sedona though, because there is nothing else to do. Your trusty blogger/ Sedona hater Jack. So lucky to “swim” for anything right now…but pumpkins…super cool! Ben and Ruby say a BIG hello to Joe and Jack!